Born in Moose Jaw, "Cactus Jack" was one of Canada's best known sportscasters. He started his radio career in Saskatoon in 1937 and later worked at CJRC and CKY radio, CBC-TV, CJAY and CKY-TV in Winnipeg. He also wrote freelance sports columns for the Winnipeg Tribune. He was first to broadcast curling play-by-play at the Brier. An honourary life member of the Granite and Strathcona Curling Clubs and the Manitoba Curling Association, he is also in the Canadian Football Hall of Fame. 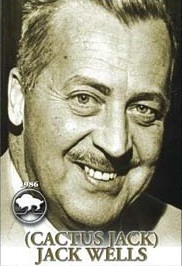 Jack Wells was named to The MSSA Media Roll of Honour in 1986.